As parents in the digital world, things are always changing and it can be hard to keep up! The app store continues to develop and grow, and it’s our goal to keep you up to date on the latest releases that your kids and their friends may be using. On today’s episode, we’re talking about 5 new apps parents need to know about in 2019. The list includes Bigo, Holla, Lipsi and more. Know of any other new apps that kids and teens are using that we haven’t covered yet? Please reach out and let us know! For better or worse, social media has completely revolutionized our world. 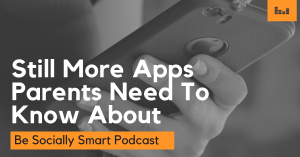 So how do we as parents navigate the world of smartphones, social media, and apps parents need to know about with our kids? On the Be Socially Smart Podcast, we’ll keep you informed on all things technology and social media. Whether you are a parent of a teen, tween or elementary age kid, this podcast is for you. Be sure to subscribe on your preferred podcast platform so you don’t miss a single episode.